A new online survey across six Asian markets found that 28% of respondents were interested in paying US$1 to download a 30-minute television show, accompanied by advertising. When offered new movies supported by advertising for the same price, even more respondents (62%) said they would be willing to pay for online downloads. The survey also offered the option to pay US$2 to buy the same content without advertising, but fewer respondents were willing to pay for TV shows (20%) or movies (53%) at the higher price, suggesting that Asian audiences would welcome advertising messages that subsidise the cost of online content downloads. The survey also found that almost half (49%) of all respondents across the six Asian markets had paid to download content, ranging from the most likely buyers in China (67%) and Taiwan (62%) to 40% in Singapore and 38% in Australia. MindShare conducted the survey among a total of 1,500 15-to-35-year-old Internet users in November 2006, using Pulse Group’s research panel across Australia, China, India, Malaysia, Singapore and Taiwan (250 respondents from each market). The MindShare survey also revealed that Asian downloaders are more likely to play digital music on their mobile phones than on MP3 players. 28% of respondents said they preferred a mobile phone for playing back songs, ranging from Malaysia (37%) and India (34%) to Singapore (33%), China (29%), Australia (25%) and Taiwan (16%). Looking into the future, 75% of those surveyed expect portable digital video players to become more popular, suggesting they want video-on-the-go to complement their portable music. In terms of overall content downloading, whether paid or unpaid, Internet users in China and Taiwan are more likely to download than other Asian users. 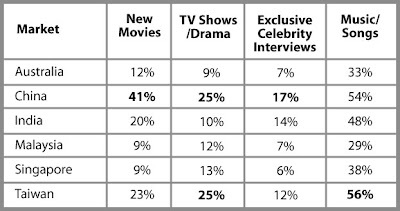 As shown by the table below, Chinese respondents were most likely to have downloaded movies (41%) and exclusive celebrity interviews (17%) while Taiwanese respondents were most likely to have downloaded TV shows (25%) and music (56%).